Next MAY 26, from 10 to 13 hours, the Closure and Outreach event of the NILS Science and Sustainability programme shall be held. It will gather institutional representatives such as the Rector of the Universidad Complutense de Madrid, the Norwegian Ambassador in Spain, and representatives from the Financial Mechanism Office in Brussels and the programme partners in Norway, Iceland and Liechtenstein. 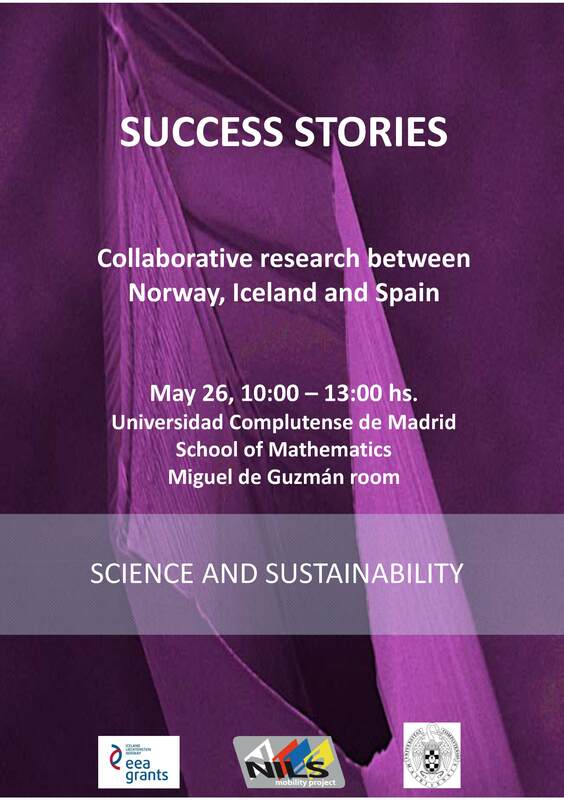 During this meeting we will have the opportunity to listen to researchers from Spain, Norway and Iceland, describing the joint research performed, the results achieved and the future cooperation opportunities opened during this period. We will also have the opportunity to visit an exhibition of about 30 scientific posters showing the diversity, extension and depth of the joint research activities carried out within NILS programme and the results achieved. Besides showing to the scientific and academic community the achievements of the NILS programme, the meeting aims at providing a forum to identify opportunities to continue the cooperation started during the NILS Science and Sustainability programme, after its completion. Leading approaches for long‐term thinking for Sustainable Development in Higher Education and Business in the North of Norway M. Fernández (Nord University, Norway); O. Jakobsen (University of Nordland, Norway). Cognitive Radio and High Performance Computing Applications J. Olivares (Universidad de Córdoba, Spain), R. Palomar (The Intervention Centre, Oslo University Hospital, Norway), F. León (Universidad de Córdoba, Spain), I. Balasingham (The Intervention Centre, Oslo University Hospital, Norway), J. Gómez-Luna (Universidad de Córdoba, Spain), O. J. Elle (The Intervention Centre, Oslo University Hospital, Norway), A. Cubero (Universidad de Córdoba, Spain), F. Alaya (Norwegian University of Science and Technology, Norway), J. M. Palomares (Universidad de Córdoba, Spain). Conservation laws of differential equations beyond Lagragian methods through nonlocal symmetries María S. Bruzón, María L. Gandarias (Universidad de Cádiz,Spain), Roman Kovlov (Norwegian School of Economics, Norway). Influence of Sea Surface Temperature on Rainfall variability B. Rodríguez-Fonseca (Universidad Complutense de Madrid, IGEO-CSIC, Spain), E. Mohino Harris (Universidad Complutense de Madrid, Spain), L. Svendsen (Nansen Enviromnmental and Remote Sensing Center, Norway), N. Keenlyside (University of Bergen, Norway), J. Bader (Max Plank Institute fur Meteorology, Germany). October 13, 2015. The final resolution of the third phase of the second bilateral relations activities call has been published. More info. On October 8 2015, the NILS programme Steering Committee dictates the provisional resolution proposal for the 2BBRR call (third evaluation phase). Further information here and at the "Calls" tab in the left menu. On September 15, 2015, the final resolution of the second phase of the second bilateral relations activities call has been published. More info. On September 8 2015, the NILS programme Steering Committee dictates the provisional resolution proposal for the 2BBRR call (second evaluation phase). Further information here and at the "Calls" tab in the left menu. NILS Programme management office will remain closed from the 8th until the 23rd of August, inclusive, due to the closing of the University for the summer holidays. During the rest of the month the office will only attend those matters that may be extremely urgent. See the official document here (only in Spanish). New elegibility rules and budget apply: click here to know the latest update of the call. Remember: the application deadline is September 30. Applicants are encouraged to apply for meetings, seminars and other activities in order to explore funding opportunities aiming at continuing the started cooperation within other schemes (such as H2020 or others), and to jointly prepare such applications. On May 22, 2015, the final resolution of the third phase of the bilateral relations activities call has been published. More info. A new bilateral relations activity cal lis open. NILS project promoters may apply for funding for activities such as exchange of knowledge, networking, organization of workshops and similar, up to 4000 euro per activity. The call text and the application form are available at the “Calls” chapter of the menu in the leff. Click here. On May 21 2015, a correction to the provisional resolution of call ABEL-IM-CM-AF call. Further information here and at the "Calls" chapter on the left menu. On May 11 2015, the NILS programme Steering Committee decided to fund five applications submitted within the bilateral relations activities call. Further information here and at the "Calls" chapter of the left menu. On 23 April 2015, the provisional resolution of the call ABEL-IM-CM-AF call has been published. Nine projects were selected for additional funding. Further information. SUMMER SCHOOL "WOMEN IN SCIENCE. REFLECTIONS AND EXPERIENCES FROM THE NORTH AND SOUTH OF EUROPE AND THE UNITED STATES". EL ESCORIAL, JUNE 29 - JULY 3. Women have contributed to science from its beginning, although this has not been fairly acknowledged. From the studies of science, it is widely described the lack of equality among women and men concerning scientific and technological production, as well as the existence of obstacles that are specific to women when accessing relevant positions in the academia, the industry and the administration. Such barriers have led to a deep reflection on the social nature of science and technology and on the strategies in order to overcome this inequality. This school aims at facing this reflection, as well as at deepening on the situation of women in the science systems in various countries such as Spain, Norway, Iceland and United States. We also aim at identifying best practices on the promotion of scientific entrepreneurship enhancing women’s and men’s initiatives, at knowing the personal experience of researchers face to face, as well as at identifying what is the gender treatment in the main source of funding for science in Europe, the Horizon2020 programme. Programme of the summer school. Mujeres y producción intelectual. Amelia Valcárcel, State Advicer. Audio. La situación de las mujeres en la ciencia. Carmen Vela, State Secretary of Research, Development and Innovation.﻿ Ministry of Science and Innovation. La intervención pública: hacia la igualdad efectiva de oportunidades. Begoña Suárez, Deputy Director for the entrepreneurship and professional promotion of women. Ministry of Health, Social Affaires and Equal Opportunities. The call text of the BBRR call, in its point 3.d, has been amended. The new deadline for activities funded within this call is 30 November 2015.See the new text in the “Calls” chapter of the left menu. On 9 March 2015 a call for additional funding to ongoing projects funded within calls ABEL-IM-2013, ABEL-CM-2013, ABEL-IM-2014A, ABEL-CM-2014A and ABEL-IM-2014B has been published. The call textand the application form are available at the chapter “Calls” of the left menu. The call is addressed to ongoing projects. In order to be eligible,projects must not have reached the end of the cost elegibility period established in the project agreement signed between the project promoter and the programme operator. On 2 March 2015, the NILS Steering Committee has dictated the provisional resolution of the second evaluation phase of the call for bilateral relations activities. Seven proposals have been selected for funding. Further information here and at the "Calls" chapter of the left side menu. On 2 February 2015 the NILS Steering Committee has agreed the final resolution of the call ABEL-IM-2014B. 27 applications have been selected for funding. Further information here and at the "Calls" chapter of the left side menu. On 16 January 2015, the NILS Steering Committee has dictated the provisional resolution of the call ABEL-IM-2014B. 27 projects have been provisionally selected for funding. Further information here and at the "Calls" chapter of the left side menu. On 15 December 2014, the NILS Steering Committee dictates the final resolution of the first evaluation phase of the call for bilateral relations activities. Three proposals have been selected for funding. Further information here and at the "Calls" chapter of the left side menu. On 5 December 2014, the NILS Steering Committee dictates the provisional resolution of the first evaluation phase of the call for bilateral relations activities. Three proposals have been selected for funding. Further information here and at the "Calls" chapter of the left side menu. 219 bachelor and master students in 11 Spanish higher education institutions have been granted within NILS programme. Further details. On 4 July the third and last ABEL-IM call is open. It funds the individual mobility of researchers. The call text, the guidelines and the application form are available in the chapter “Calls” of the left menu. Call text here. The Bilateral Relations activities call is open now. Project promoters within NILS programme may apply for funding for activities such as exchange of knowledge, networking, organization of workshops and similar, up to 6000 euro per activity. Click here or look at the “Calls” chapter at the left menu. On 24 June 2014, the NILS Steering Committee has decided the provisional resolution of the call ABEL-CM-2014A. Click here or look at the “Calls” chapter at the left menu. On 24 June 2014, the NILS Steering Committee dictates the provisional resolution of the call ABEL-IM-2014A. Click here or look at the “Calls” chapter at the left menu. On 13 June 2014, the NILS Steering Committee agrees the provisional resolution of the call ABEL-IM-2014A. Click here or look at the “Calls” chapter at the left menu. On 13 June 2014, the NILS Steering Committee agrees the provisional resolution of the call ABEL-CM-2014A. Click here or look at the “Calls” chapter at the left menu. On February 21, 2015, the final resolution of the call ABEL-CM-2013.Click here or look at the “Calls” chapter at the left menu. The available budget for the calls ABEL-IM-2014A and ABEL-CM-2014A has been updated. Click here or look at the “Calls” chapter at the left menu. On February 13, 2014, the NILS programme Steering Committee dictates the provisional resolution of the call ABEL-CM-2013. Click hereor look at the “Calls” chapter at the left menu. On February 7, 2014, the final resolution of the call ABEL-IM-2013 has been dictated. Click here or look at the “Calls” chapter at the left menu. ABEL calls, addressed to researchers in any momento of their career, are open from January 1st until February 28th. All documents related to the call are available at the “Calls” chapter of the left menu: call text,guidelines to the call and application form. Abel Individual Mobility of Researchers: supports mobility of researchers from Spain to Norway, Iceland and Liechtenstein, and from these three to Spain, with the aim of performing research and training activities on challenges related to Earth Sustainability and Human Wellbeing. Deadline for submitting applications: February 28. Abel Coordinated Mobility of Researchers: supports mobility of research teams from Spain to Norway, Iceland and Liechtenstein, and from these three to Spain, with the aim of performing research and training activities on challenges related to Earth Sustainability and Human Wellbeing. Deadline for submitting applications: February 28. ﻿Preparatory visits in order to prepare Abel applications. On December 4, 2013, the NILS Science and Sustainability programme Steering Committee dictates the Final resolution of the call STUD-INSTIT-2013. 11 projects have been selected. Click here or look at the “Calls” chapter at the left menu. On November 20, 2013, the NILS Science and Sustainability programme Steering Committee dictates the provisional resolution of the call STUD-INSTIT-2013. 11 projects have been selected. Click hereor look at the “Calls” chapter at the left menu. - Application deadline is October 20, 2013. - Electronic signatures are allowed. - Scanned letter of commitment are allowed. - Annexes (except CVs) may be submitted until October 25. Welcome to the NILS programme presentation event, which will take place next September 19, at 10:00 hs, at the Faculty of Mathematics of Universidad Complutense de Madrid. UCM Rector, Prof. José Carrillo, Norwegian embassador in Spain, Mr. Johan Vibe, the honorary general cónsul of Iceland in Spain, Mr. Fco. Javier Pérez-Bustamante, and Deputy Director of the Cohesion Fund and European Territorial Cooperation, mr. Fernando Fernánez, shall be with us, as well as representatives from theprogramme partners, SIU, RANNIS and AIBA. Sustainability is a major challenge that mankind is bound to face in the XXI century. Learning to live in a sustainable planet and at the same time being able to provide food, water and basic care for Earths population will require strong political leadership and focused, cutting-edge interdisciplinary scientific research. At a scientific level, sustainability poses a number of formidable problems. To face them, interdisciplinary teams need to be formed, and within them, mathematicians will play a key role. In mathematical terms, modelling, analysis and advanced computation are key tools needed to address relevant issues in social and natural sciences related to sustainability. Students mobility Bachelor and master students in Spanish universities, in order to carry out studies in universities located in Norway, Iceland and Liechtenstein, within their official study programme. during academic year 2014-2015. Researchers mobility Researchers in experimental sciences in Spain on the one side, and in Norway, Iceland or Liechtenstein in the other side, in any moment of their career, in order to carry out joint research and advanced training activities dealing with problems related to Earth Sustainability and Human Well-Being. NILS Science and Sustainability benefits from a 3 918 000 euro grant from Iceland, Liechtenstein and Norway through the EEA Grants. Through the EEA Grants and Norway Grants, Iceland, Liechtenstein and Norway contribute to reducing social and economic disparities and to strengthening bilateral relations with the beneficiary countries in Europe. The three countries cooperate closely with the EU through the Agreement on the European Economic Area (EEA). 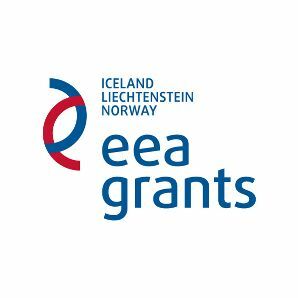 For the period 2009-23014, the EEA Grants and Norway Grants amount to €1.79 billion. Norway contributes around 97% of the total funding. Grants are available for NGOs, research and academic institutions, and the public and private sectors in the 12 newest 12 EU member states, Greece, Portugal and Spain. There is broad cooperation with donor state entities, and activities may be implemented until 2016 (2015 for Spain). The EEA Grants have a no-tolerance policy on corruption and mismanagement. Complaints and alerts on suspected irregularities may be submitted directly to any agency involved in the implementaitn of the grant schemes, including the Financial Mechanism Office (FMO).